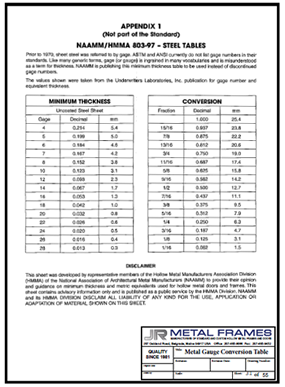 JR Metal Frames offers frames in both standard sizes and custom widths and lengths. We do welded, KD to weld and knock down frames in many different profile options. All of our steel frames are American Made from USA recycled steel and come A-40 galvaneal. Steel standard with options of 12, 14, 16, or 18 gauge material. A-60 and G-90 steel is also available. 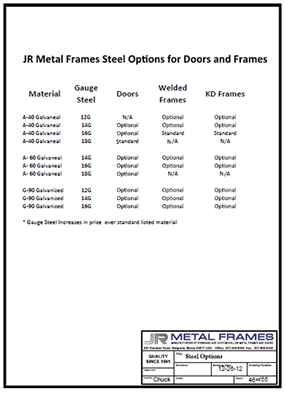 With JR Metal Frames, 3 sided frame welded or knock down is standard with the following preps when ordered: ASA lock prep, 4 1/2 " regular weight hinges, pressure anchors, and a 2" face. Frames are primed gray, finished smooth and ready to paint. Click one of the images below to see the PDF of the document.